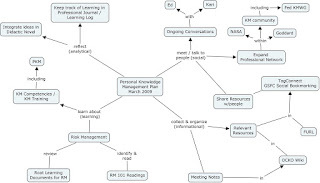 A while ago I created a diagram representing what I consider to be my Personal Learning Environment (PLE). It essentially consisted of a visual representation (a map) of all the tools I use to keep track of information resources (notes, books, electronic resources, social networks, work documents, etc...) that are essential to my work/learning. The diagram also attempted to show how all these tools were connected and allowed the identification of some key inefficiencies related to the lack of synchronization and duplication of tools/methods at the office (fixed infrastructure) and at home (a more mobile set of tools). The initial impetus for creating this PLE map had been the frustration I was encountering with my mix of paper/electronic tools. Today I created a Personal Knowledge Management Plan. To make it relatively simple as a first attempt, I am limiting myself to short term needs and developing a plan for March 2009. 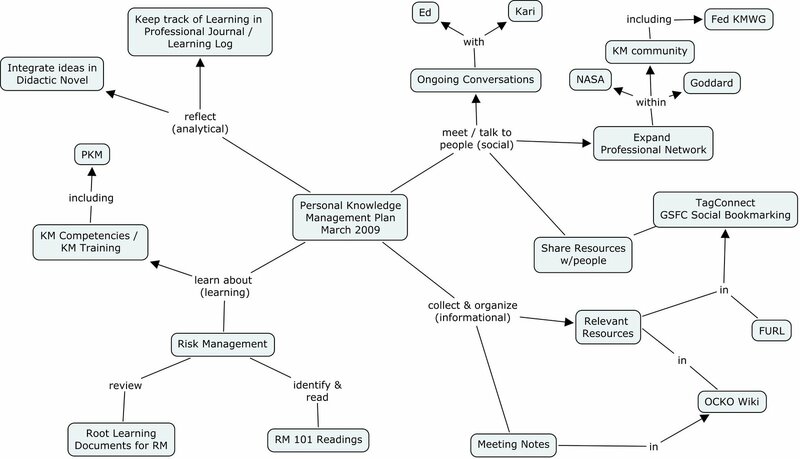 I am also using the framework defined by Kirby Wright in his "Personal Knowledge Management Planning Guide." The guide offers two possible formats for a personal knowledge management plan, a graphical format and a table format. My initial attempt, below, is an adaptation of the graphical format. I must admit that I am having some difficulty differentiating the Learning Dimension and the Analytical Dimension of Kirby Wright's framework. Click on the image to view the details. Ideally, I would review the plan on a monthly basis and adjust it as needed. I probably need to be more specific about the KM/learning goals embedded in this map but as a first monthly map, it will serve its purpose. Getting back to the initial question of how the PKM plan and the PLE are related, the PKM plan answers a "what" question (what do I want to focus my learning on?) and the PLE is more focused on the "how", and "where" questions and on information/content management issues. I suspect my thinking about this will evolve over time. It doesn't feel very mature at this point. Let's call it emergent thinking.